All this spectacular scenery to poop on. Poop anywhere, and leave toilet paper all over. Streamers of T.P. are so attractive in their delicate minimalism, and when the rain transforms the paper to a white crust of papier maché it creates the alluring natural effect of a white barnacle on the pristine lava rocks. It’s reassuring for anyone who passes along a path to find signs that someone else has been here first, so mark the way as safe with a turd and a big clump of T.P.! Shower improperly at the pools. To really raise some hackles, put your suit on before you go in the shower and run past the water. Be careful to get a wee bit sprinkled but not get your hair wet. 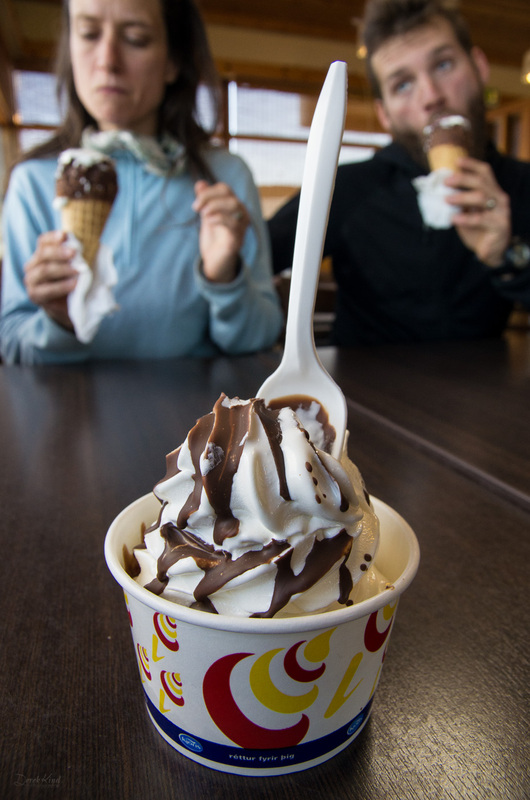 Why waste all that fresh hair gel from yesterday? Why not go for more glares, and act all weirdly prudish trying to not look at the naked people! Act like you own the place. So what if birds nest here. You, vs. birds? Those birds, they can dig new tunnels to nest in, it’s so much more important for you to walk out there on the grass past the signs. Erosion problems? Pfft. Obviously the path isn’t so eroded it can’t take just one more visitor. Anyone behind a counter is here to serve you, so use a commanding voice, preferably loud, and demand to know where the bathrooms are, why the bus isn’t on time, and where’s the salad dressing. Queues are for chumps. Drop your litter everywhere. There are hardly any public trash cans except for at gas stations, so of course that means you can throw your litter everywhere. In the parking lots, into the waterfalls, and in the ditch anywhere you pull over. It’s so windy in Iceland, the wind will pick up all your trash and carry it to where it can hang up in some thorns or on a fence and dramatically improve someone else’s photos. Cigarette butts don’t count as trash, so feel free to drop and stomp them into the rocks and rivers. They slip so handily into the cracks in the porous lava rocks it’s almost as if they were meant to be, and they add a much needed contrast to the pure blacks and reds of the stones underfoot. Butts in moss- now that’s fine art. The sundlaugs are minimally treated with chemicals, and that’s possible because everyone who uses them scrupulously cleans themselves. That means showering like you’re at home, naked, soaping everywhere and shampooing hair. Like you’re at home- that thoroughly. There are signs in every pool explaining the procedure in 5 languages. Figure it out. Take some responsibility! Collect your trash and wait for an appropriate place. I think I’m going to have to write a rant about proper toilet paper use in the wild. It’s a problem the world over, it seems. Suspicious sheep are watching you. Mývatn Nature Baths. These blue hot pools are like the Blue Lagoon only so much better because the water isn’t salty. Everyone goes to the Blue Lagoon because it’s the done thing, and all that, but if you had to choose only one, these are better. The pool is huge and there are multiple areas with different temperatures and room to lounge in the dreamy steam for hours, especially in the dark. One of the best pools in Iceland. However, this place gets a total fail on the changerooms. A surprise, since it’s all tarted up with art and spa facilities with a price tag to match, but the women’s changeroom was tiny, wet, had tepid showers, and was absolutely filthy when I was there. No more than 6-8 women at a time could use it comfortably at once; it was smaller than some of the smallest town sundlaugs, and I was very happy it wasn’t crowded when I was there. Gvenarlaug. 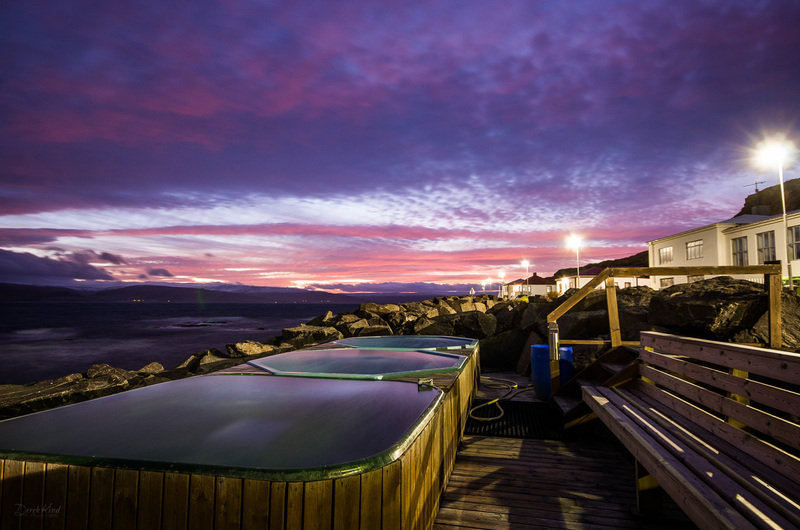 Next to the friendly Hótel Laugarhóll and the turf roofed Sorcerer’s Cottage (connected to the Hólmavík witchcraft museum) lies a beautiful rock-lined and very hot outdoor pool. It’s even holy water. When you get too hot you can lay in the small cooler river flowing next to it. Ahhhh, so hot. Often in Iceland because it was so cold in the fall we were disappointed when the hot pools weren’t, quite, hot enough. 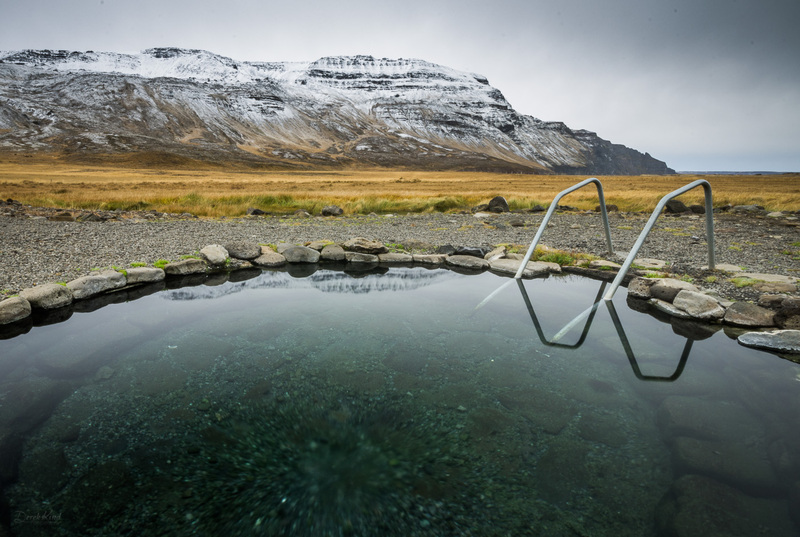 After hunting for Hellalaug in the night and not finding it, we were delighted to locate the pool near Reykjafjörður. At first it wasn’t promising- the rectangular pool full of cool water, but following a watery ditch uphill we found the real hot pool, one of the loveliest outdoor pools in Iceland. The water here was almost too hot at first, and there are tiered pots to get farther from the hot source. For the best view from a hot pot there’s Hellalaug, an unmarked right turn less than a mile to the right getting off the ferry from Stykkisholmur. The rock pool looks out over the fjord, but it wasn’t hot enough to be exciting in the wintertime. Krossneslaug, two km north of Norðurfjörður at the end of the world has an incredible view, but not from in the hot pot- that’s walled off for wind. On the way at Drangsnes there are three cute square jacuzzi tubs on the side of the road overlooking the beach, and there are even fancy change rooms across the road. It makes for a cold dash across, and the water wasn’t quite hot enough for the wintertime. We became connoisseurs of the public pools, sundlaugar, especially the waterslides. Stykkisholmur, Akureyri, and Höfn have big beautiful sundlaugar, the best slides are in Reykjavík, and Siglufjörður has a short waterslide but the fastest- it made me dizzy. Dalvík has a beautiful fancy pool but the waterslide didn’t have enough oomph to spit us out, although it was funny to squeak to a total halt on the last turn and then scoot the rest of the way out. Patreksfjörður has a lovely serene pool in the sunshine with a view. 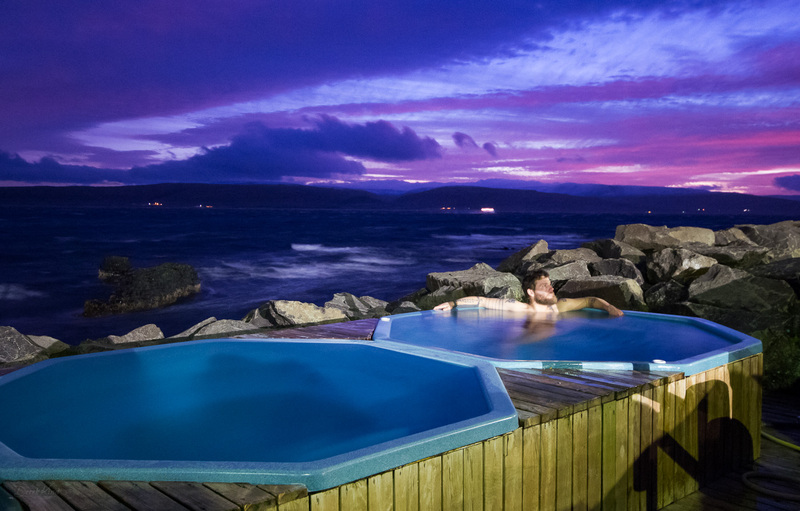 Hrísey island has a treasure of a sundlaug, with the cheapest admission and the best showers, also jets in the outdoor hot pool. Djupivogur is like being in the pool inside of a greenhouse, with a solid wall of windows. At Djupidalur on the Westfjords we were hot pool hunting and surprised to find a pool on a farm in the middle of nowhere (also a guesthouse). The small lap lane pool was totally indoors in a building of it’s own, with a hot tub outside in the back (pay at the farm). It was so windy that even with the barrier walls around us, the water was lifting out of the pool in little sheets, and it was extremely painful to get out to run back inside. The incongruous pool inside(!) was lovely, though. Grettislaug, north of Sauðárkrókur, is supposedly the same water that Grettir of the Saga bathed in after swimming across from Drangey. His pool isn’t that warm though. Jarlslaug (right next to it) is much better. These are kind of odd rock hot pools, rather on an exposed beach, with a few buildings around. Seljavallalaug. 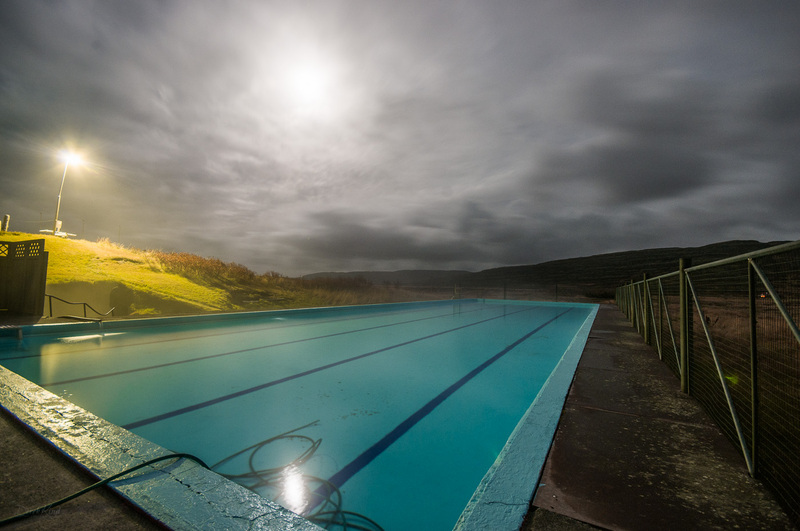 This was a really cool pool built in the 40’s, I think, with an incredible Lord of the Rings-esque view of a dark green valley with walls looming over you. 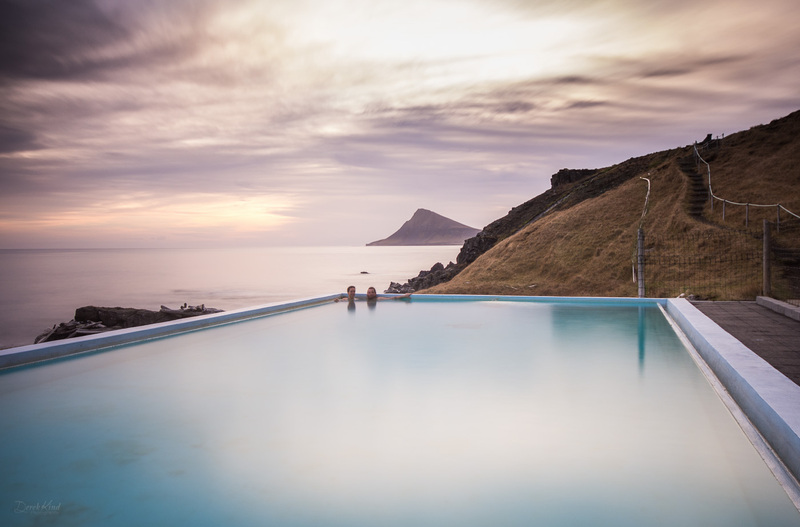 Even more amazing than that this pool is out there in the middle of nowhere is that we found it, based on this solitary sentence in the Lonely Planet: “Built into a hillside at Seljavellir…Park by the farm and follow the path upwards”. The ambiguity is not only “the farm” (there are several candidates on a road that makes a loop), but also that the path hardly goes “upwards” in elevation, like I assumed, rather continues from where a spur road off the loop ends. We carried straight on into the valley, following the water flowing out and an occasionally visible path through the gravel and on the side of the hill at times, and that worked. The problem is how darn cold the pool was. We huddled tightly in the corner of the pool that had the warm inlet, hugging the pipe and trying to stay as motionless as possible, but still the water leeched our body heat more than it warmed us, so eventually we cut our losses and fled, colder than we’d arrived. Would be a “worst” candidate, but the cool water temp could be pleasant in high summer, say for a vigorous swim, and the surroundings are gorgeous. Just don’t expect be be warmed. 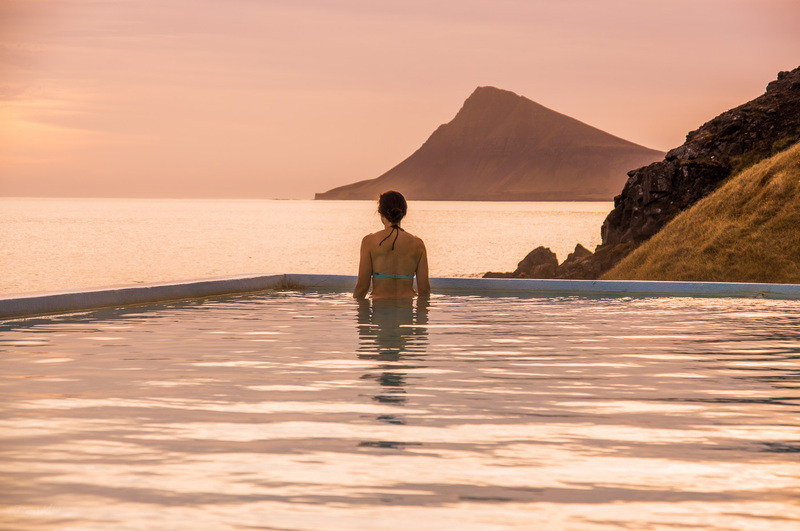 By Lýsuhóll on Snæfellsnes there’s an “outdoor pool” next to the sundlaug (didn’t try either) that is just -whoa. It’s a square tub buried to grade level in an open field of spongy mud by the road, with not very hot water piped in and then overflowing all over the area. The whole tub and surroundings are encrusted with orange mineral buildup. If the wind, exposure, and muddy approach doesn’t put you off, the dirty water and slimy algae beards might. I got the impression no one goes in the outdoor pool anymore. Finding hot pools can be no mean feat. If you can find (and afford), this book, then you’re done. It has it all. Enjoy Iceland is the best map resource online. Some of the directions, though…super vague. Good luck. This site has a different opinion, but a lovely picture of Seljavallalaug, and a couple pools we haven’t been in. Grjótagjá is actually too hot to get into unless you grew up getting into it or you’re outside the normal range of pain and pleasure tolerance. It’s super-cool and a Mývatn must-see (walk further away from town and there’s another cave too), but don’t be disappointed that you can’t get in. It’s a critical few degrees above tolerable. 1. Gaiters for over the rain pants and gore-tex boots are non-negotiable for cycling, and debatably if you want to get out of your car anywhere in the fall. 2. Waterproof panniers- don’t even think about liners, or garbage bags, at least not in the fall. Your stuff will get wet. Riding and camping, day after day, everything will get wet. 3. Twice as many dry bags as you think you’ll need. I had four, plus my waterproof panniers. I had the cheap ones, not the eVents, and I still had no problem compressing them quite adequately. 5. Waterproof ziploc bag for cell phone (there are lots of kinds). This was an impulse REI purchase the day we left, and H.W. envied it the whole trip. My phone almost never came out of it. There are Otter boxes, too, and “guaranteed” waterproof phones, but H.W. has had one of those that turned out not to be, so I still recommend the fancy phone ziploc. Notice a theme? Rain, rain, rain. If you’re cycling, rain is a concern. 6. At the same time I bought Tenacious Tape , and that was really clutch. 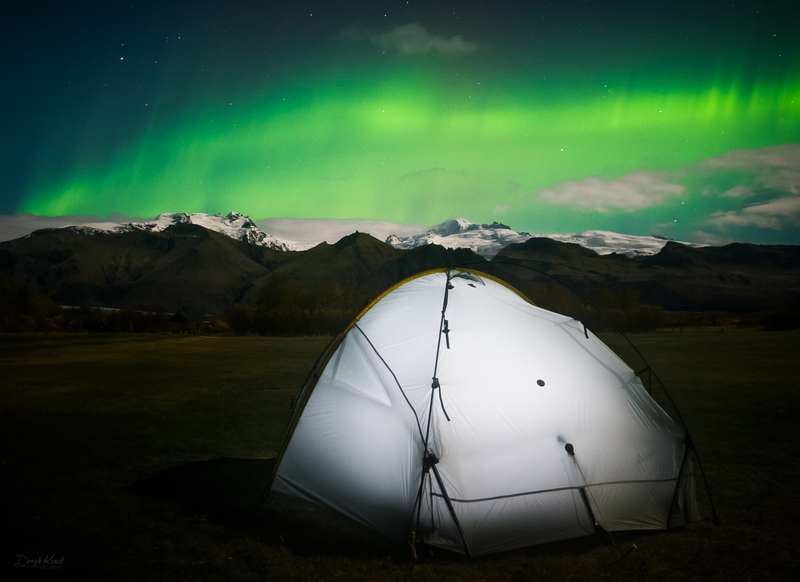 Iceland is full of lava that rips up synthetic stuff, and wind that breaks your tent, etc. We patched up everything with it. Speaking of which, you need a strong tent. 7. 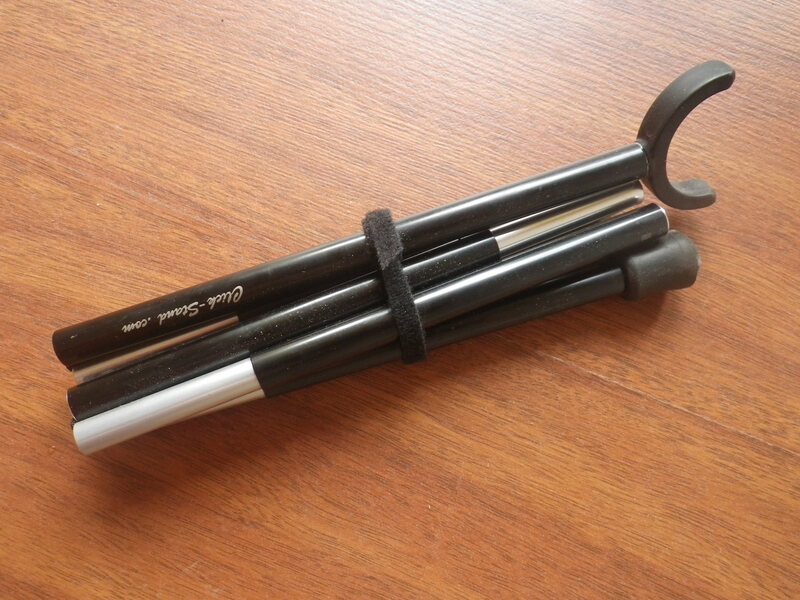 A Click-Stand. 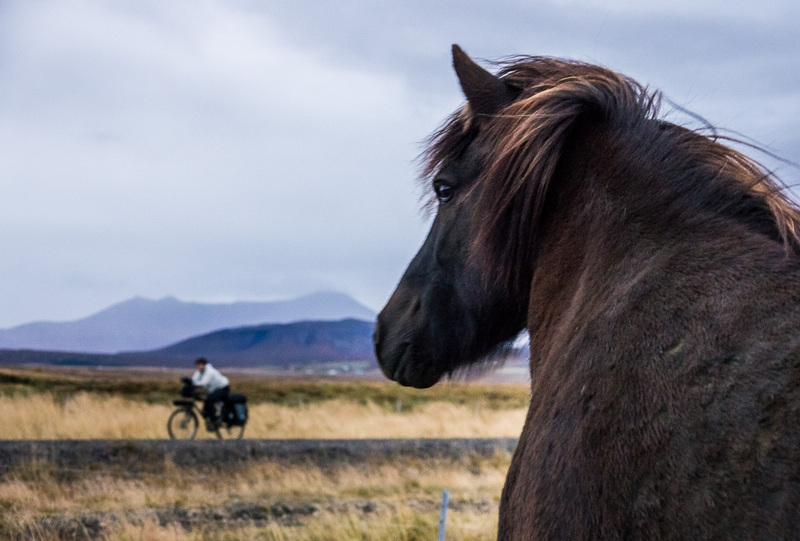 There are no branches lying around in Iceland to prop your loaded bike up with, and even fewer parking meters. It’s no fun laying a loaded bike down, and picking it up. We loved our Click-stands, and they proved worth the price, although H.W. was initially skeptical. 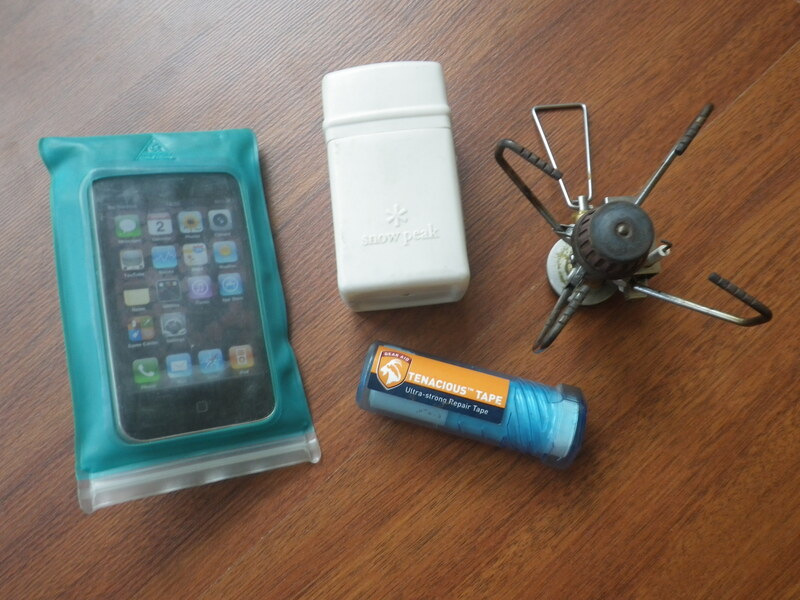 Also in the lead photo there’s included my tiny stove and the box that it packs into, to show its scale. I just think this tiny stove (the Snow Peak Gigapower) is so awesome. Really its only downside is that it’s darn easy to lose in the rest of your stuff, since it compares to a deck of cards. The first time I saw it I was asking my brother if he had the stove and he said, “Why yes, right here in my pocket,” and pulled it out of his jeans, like Steve Jobs pulling the MB Air out of the manila envelope. It screws onto the can of fuel that forms the base, and that kind of fuel can is easy to find in Iceland. In fact, the HI hostel/campground in Reykjavík had heaps of partial cans discarded by departing travelers, for free. *rain is not nearly the same concern touring in July and August. But come September, watch out! Determined to make it to Skaftafell, we were riding (our bikes) late at night across the sandar. The great expanse of grey sandar, a thousand square kilometers of volcanic ash and gravel coughed up by the eruption of Öræfi, is eerie and beautiful in the dark, silent and glittery with the numberless rivulets of water finding their way to the sea. There is no option to camp in the sandar, so once we entered it, we knew we had to make it the whole way. There was no traffic but the big trucks that haul after dark, and they were few and far between. My brother was far ahead of us in his truck, and we were riding hypnotically side by side and talking, comfortable knowing we could see traffic in either direction ten miles away. There are long wooden bridges with grated metal decks crossing the rivers. Some seemed a half mile long. The last one was mangled and tossed aside by the water in 1996 when Grímsvötn erupted, and there are some twisted steel beams like modern art on the side of the road there as memorial. 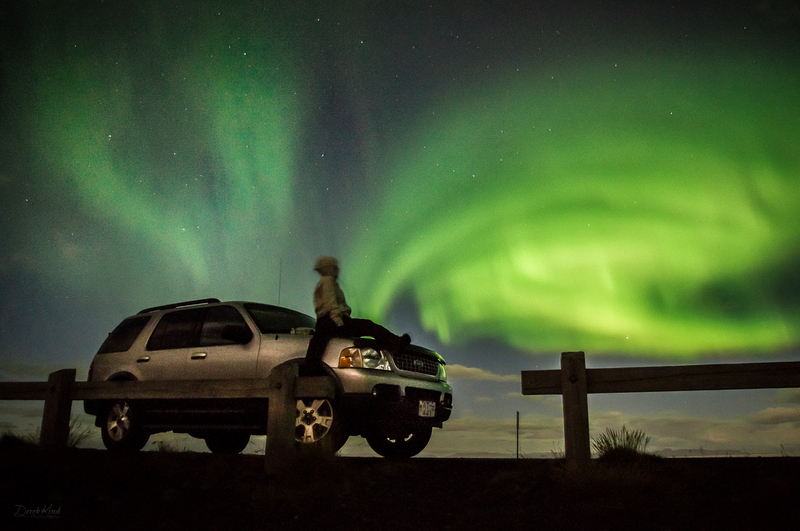 Just as we passed there, the indigo sky opened up in Northern lights, and we overtook my brother, who was parked taking pictures. He said he could hear us coming by our excited whooping and shrieking at the sky. Over and over the waves of lights flickered through the sky, brighter than moonlight, gorgeous. We were cold from riding hot and stopping, but we couldn’t stop watching the lights, and we posed for some pictures with our bikes. Late in the night, we rode the final miles to Skaftafell, looking forward to the flat camping and hot showers we knew to expect there, and the thunderous cracking of the glacier next to the park. 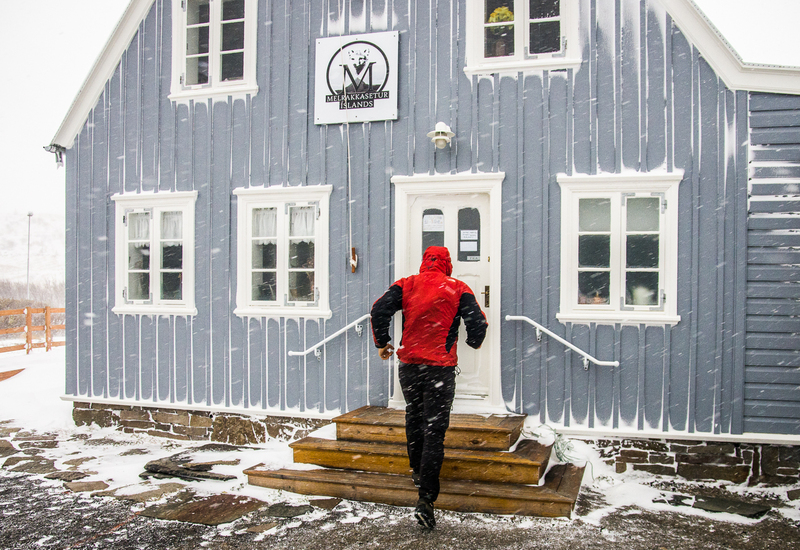 The town of Siglufjörður was wet and cold when we got there, but when we were looking around the herring factory museum, a man came out, said it was closed for the day and he was tired, but he would open it up in the morning around 8. Interested, we decided to bed down early and visit the museum in the morning. It was a good choice. We soaked at the pool, the hostel was wonderful and we had it to ourselves in the off season. In the morning we went around to the museum again. A young woman turned on all the lights for us and left us to our own devices. An hour or so later, the man from the previous day came downstairs, talked with us and then invited us upstairs for tea. There were a couple of other men there, directors, or sponsors?, and the young woman. They shared tea and cookies and talked about the administration of the museum, the history of saving the property, and scrounging up the parts of other abandoned herring factories that were being scrapped to reassemble the museum as it is now, housed in multiple buildings with the multiple functions the factory had. About three hours passed before we’d seen it all, and I left with a children’s book written and illustrated in exquisite watercolours by the same man who invited us for tea- the museum director and driving force of the whole project. I wasn’t able to find him again to have my book signed, though. There’s a very prominent bowling alley on the strip of museums of all sorts that have sprung up on the road to the airport. Since we were resting up in Akureyri and enjoying the sundlaug and buffet at Bautinn, we thought we’d try out some bowling. Nothing prepared us for Friday night at the lanes. It was crowded with young people, but not just young people. There were ladies dressed to the nines and eyeballing the boys two lanes over, the booze was flying (literally- glasses of beer smashed on the hardwood), there were catastrophic drunks, we got invited to a party, a scuffle broke out, and there was some majestically abysmal bowling. Clearly it wasn’t about the bowling skills at all, since it didn’t seem to matter if a ball even made it down the lane it was meant to or any lane at all. It was pretty typical style for nearly everyone to hurl the ball out and release it at eye level, where it would smash down painfully onto the lane and possibly make it down to the pins. More than once someone wiped out and hurtled themselves into the gutter. It was a mesmerizing spectacle. It was also the first time I’d bowled tenpin, so I thought that was pretty cool. It was so totally fun we came back with my brother the next night, and that’s how we missed the significant earthquake that knocked plates off of shelves and shook the earth all around us in the north of Iceland. Everything was shaking and rumbling already in the bowling alley, and we had no idea. In retrospect though, there was one patch of time where half the lanes malfunctioned at the same time, resetting pins inappropriately or not resetting, and not counting the scores or returning balls. That was probably the moment of the earthquake. 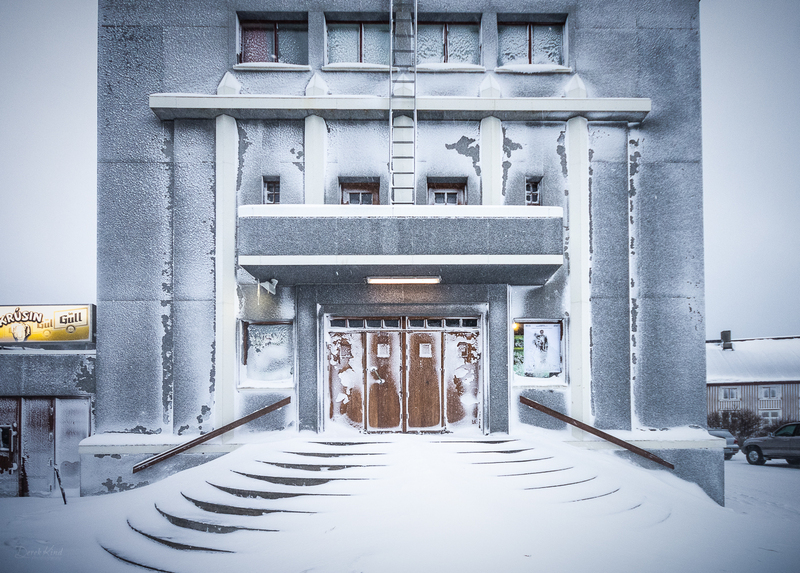 Besides the off season perks of having special attention as the only tourists or else empty hostels to ourselves, the best thing about being in Iceland so late in the year was the Jolaöl, and the hilarity of trying to pronounce it. Already knocking back the familiar Egil’s Malts like nobody’s business (tall cans of non-alcoholic orange flavoured stout-esque non-beer), one day in Mývatn there were these blue cans that we hadn’t seen before. Wow! Jolaöl was the tall blonde version of Egil’s Malt, perfectly sweet and bubbly and orangey-beery. Technically a soda, although it tastes more like a beer, this blew away every soft drink I’ve ever had (except OOgave is pretty darn good too). It’s a special holiday beverage, appearing just shortly before Christmas. We promptly started buying it 12 at a time and freaking out when there were no cans left in the back seat. Especially incredible had cold with a hot pool. Likewise for specialty Christmas products was Jolaskyr- skyr, which we were eating pounds of daily, packaged with Santa Claus on it, and flavoured with candied apples! Vík, or more specifically the famously recognizable rock formations at Reynisfjara and nearby Dyrhólaey, is notorious for being socked in, grey and overcast and rainy. In 2010 we passed through a total of four times and had the same weather every time. This time, the sun was out in full force, warm on the black rocks and black sand beach, and the stacks were bright and formidable in the sea, haloed with swirling birds. My brother and I climbed over the piles of huge black rocks, farther and farther from the main beach in the low tide, finding little coves of pebbled beaches strewn with bones and bird bodies, until I could see Vík and was sure I could get all the way around the point by the beach. My better sense prevailed – my bike was at the parking lot, and by the time we got back out to it, the weather had changed, surprise, surprise. who told me No he couldn’t rent me a room, they were all closed for the year, and the restaurant was closed too. He called a restaurant in the next town to see if they were open and could feed us, and when they were not, then said Well maybe I could feed you some bread, and salad, and maybe there’s some soup. 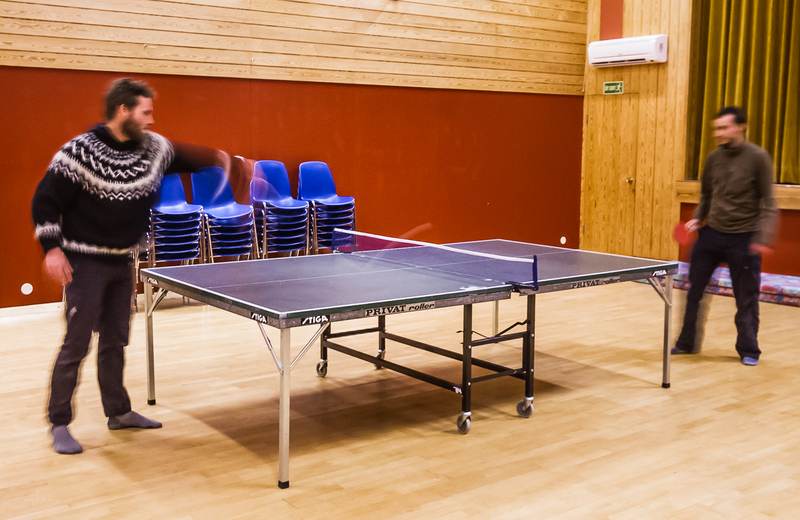 He produced a wonderful meal, then told us we could sleep in the gymnasium if we wanted, and by the way there was a ping pong table. Best night ever! 17 Derek learning to drive a gas vehicle. He’s only ever driven a diesel before, with the ultra-slow accelerator response, so his first time in a gasoline vehicle was like the Formula 500, and it was a pretty large truck. The first two days were full of peeling away with a screech from green lights (Ooops, sorry. I hardly pushed it!) and very abrupt halts (Ooops, sorry. Wow, these brakes really brake). It was pretty funny, especially when I was coaching him on the drive out of the parking lot from the people we just rented it from: Okay, just barrrrely touch it. Errrrk! Whoa!! I barely touched it! Are all gas vehicles like this? This is what people are driving in all the time? Uh, yeah, it is! Watch out for the sidewalk there- Errrk! Did they see that? Ummm, yep. They’re watching. I wanted to email a week later- your truck’s still intact! I just about died laughing. But he got used to it and no one and nothing got hurt. I wanted to email a week later- your truck’s still intact! Sleeping in caves. There was one big enough to set up two tents in, right next to the road, dry and open, and another half full of snow that we threw down sleeping bags in the bottom of. 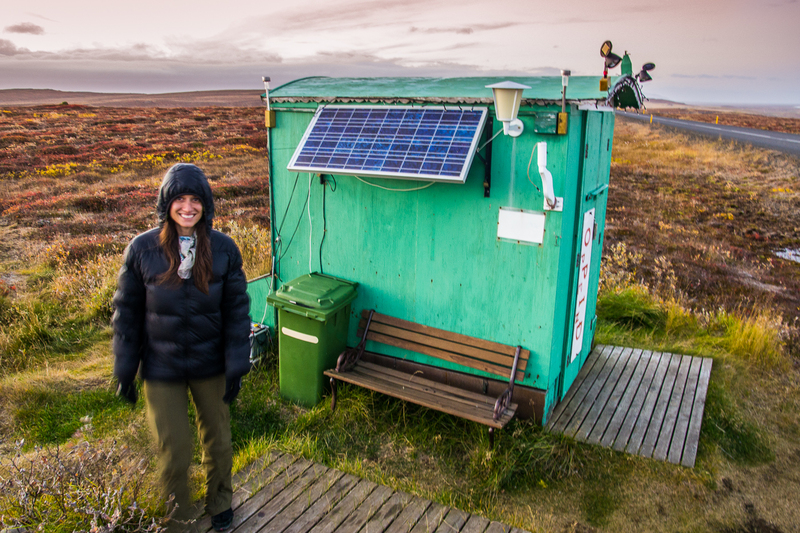 The solar powered drink dispenser in the middle of nowhere- wonderful! Hotel Hellisandur and the fancy buffet of exotic foods and meats. 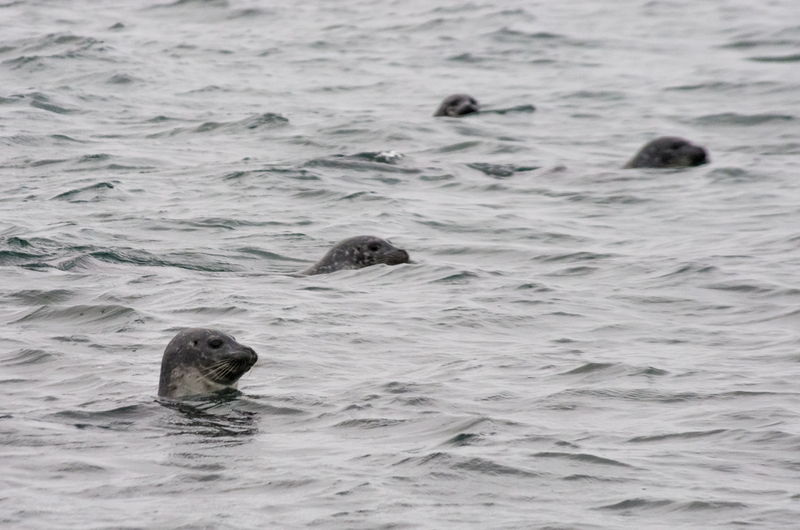 Walking on the beach by Hvítserker, where 24 seals bobbed in the water watching us and following us along the beach, popping under the water if you made eye contact. Psst, we’re being watched. When we went in 2010 the Center was closed, but there was a fox kit outside in a play structure/enclosure being cute, fuzzy, long-legged, and adorable. Going inside the Fox center was a must do on my list this time. At the end of a long time trapped by the weather in Ísafjörður, we forayed out to Suðavík, only 15 minutes away, to visit the Fox Center. Our hostess at the gisthus we were staying refused to take our room keys back because she thought we wouldn’t get far, but we had already packed all our stuff into the truck intended to check out. This proved fortunate. Most of the roads in the area were still closed and there was no way out of the Westfjords yet, but this stretch was supposed to be fine. There were flurries across the road, but it wasn’t too bad driving at all. We called and brought the beautiful Ester out of her cozy house to open up the Fox Center for us. We talked at great length, looked at the museum, watched a movie over waffles, discussed the building of the Center and Frosty, the first fox we met in 2010. When we left, the weather had turned and a slide had closed the road behind us, a half hour after we’d passed. Luckily, we found another cozy guesthouse in Suðavík, promptly getting stuck there in the blizzard for another couple days. Buried in a local paper with a feature on the sheep buried in the snow at Akureyri, there was a sidebar on wild horse roundups in the north of Iceland. We’d never heard of such a thing, and there was one scheduled a few days away. 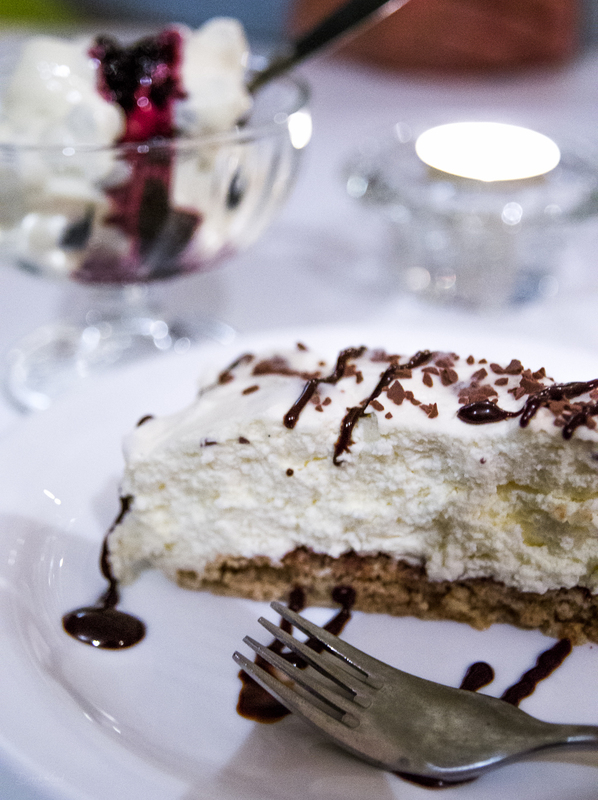 Far in the Northeast, we asked someone (Erlingur at Hotel Norðurljos) about it. He called a friend and came back with instructions to the place, his friend’s name, who would be there, and to pass on that we “absolutely must go. A horse roundup is not to be missed”. So we went. 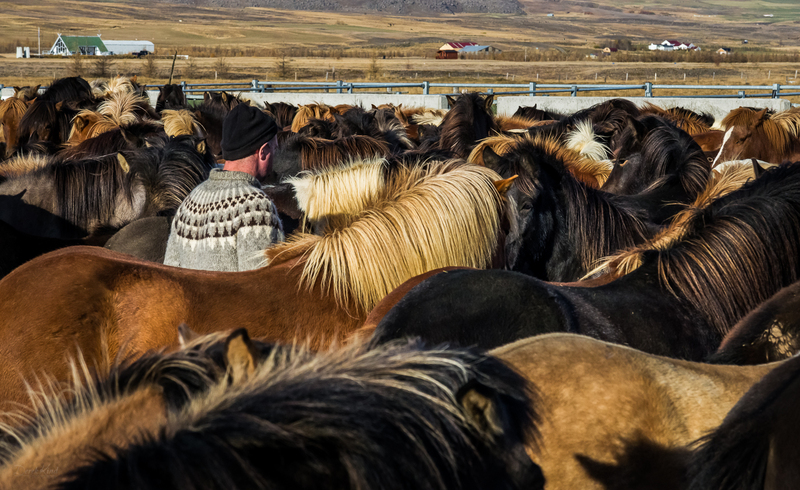 The horses were all driven from a field into a corral, and then the horses were sorted out by the owners and dragged through gates into holding pens and then shuttled away in horse trailers. We were possibly the only tourists there and were wholly ignored, sitting up on the wall of the corral and petting the few horses who were calm enough to be interested in visiting. It was a loud, dusty, active event. It was clearly an all ages social to-do. The people were all yelling at the horses and each other, trying to cut horses out of the herd, grab them by the head and drag them into a corner. They were checking chips in their ears with a reader. There was much drinking and public urination and snuffing tobacco and laughing and lists on clipboards. Although they were whinnying and biting each other, the horses were less frantic than one would expect. At first crowded tightly in and then once horses were sorted out and there was more room, they got harder to grab, and would stampede together from one end to the other, knocking people over, bucking, stomping on feet. Some horses were incredibly upset at being separated from others, trying to go through the same gate as their friends, sometimes managing it and then being forced out. Colts at their first roundup looked sad, trying to keep track of their moms and crying at being separated from them, getting jostled and nipped by the big horses. There’s a wonderful thrift store in a certain city in Iceland that we found in 2010 and went back to this time. It was exactly the same. Messy, crowded, tended by the same no-nonsense lady who can’t or won’t speak a work of English. I found fabulous things there last time that became wardrobe favourites and it was no different this time. I cleaned up on clothes that were like nothing I’d seen before, even though I’d have to toss some of the clothes I’d brought to Iceland with me. Icelanders take unique fashion to a whole new level. Even their leftovers are awesome. Then there were the sweaters. We had been checking out Icelandic wool sweaters on everyone and for sale at various places in the country, as I wanted to get one this trip. Sweaters have a vast variety, and H.W. had put a specific request in to the universe: “I want a sweater with a hood, black and grey, with a zipper”. Hooded sweaters are not very common at all. And there it was exactly, in that thrift store, only it was a women’s version, a lovely charcoal grey and a perfect fit for me. They had a whole rack of sweaters, some of them just as nice as the ones for sale down the street for hundreds of dollars. So I got the sweater H.W. had ordered, and he ended up with one with no hood or zipper. Ever since I saw a movie of reindeer running, I’ve wanted to go to Lapland and see the herds migrating. I didn’t even know there were reindeer in Iceland until I read it somewhere on our way into the Eastfjörds. I was very excited to see reindeer and promptly, the deer delivered. Riding our bikes into Höfn, there was a family unit of deer in the field. The next day there were more deer, closer, walking along the other side of a fence by the road. They have such beautifully swooping antlers. But that was nothing. 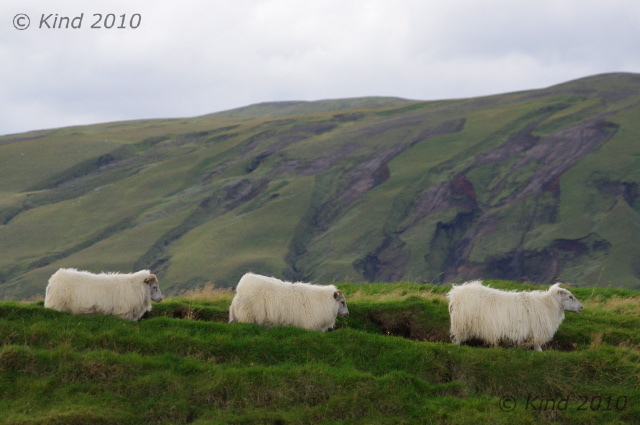 In the truck later near Reyðarfjörður, suddenly we noticed a hillside speckled with snowy patches- that were moving. We turned around and parked to watch and take pictures, and there were over a hundred deer on the slope, involved in every kind of deer behaviour. Most were lounging, some were agitating and rousting up the loungers, some were sneaking into others’ territory, some were bullying, some were grazing, some were headbutting their moms in the belly, some bulls were harassing the ladies, and there were a couple full scale clashes over territorial disputes. It was a city of reindeer, there in full sight of the road, as if they knew it wasn’t hunting season quite yet. 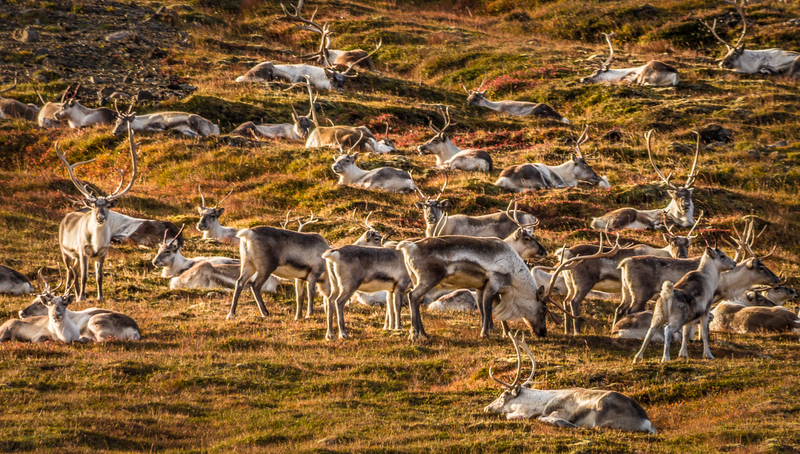 The reindeer were introduced to Iceland for a meat crop that never took on, and now the wild population is limited to the Eastfjörds for some reason (climate?) and controlled by hunting. 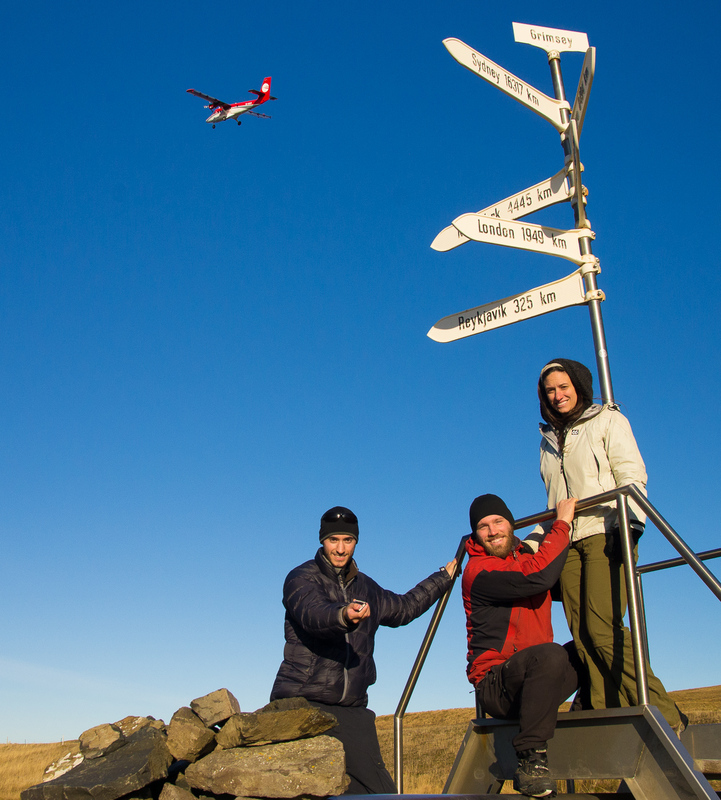 To officially visit the Arctic Circle in Iceland one has to ferry or fly to Grímsey and then walk a hundred yards north from the airport. There’s a signpost there to take pictures by. We booked cheap flights to the island, arrived at the airport far too early (we left again to get ice cream for breakfast and then went back), and when I checked in I was startled that not only did I not have to provide any ID, he didn’t even ask my name, just handed me the three boarding passes. Then he took our day packs (checked luggage) and we went to sit in the sunbright waiting room. We could see the plane, a Twin Otter, pull up, and we saw the same guy who’d checked us in stroll out to the plane with our backpacks on one arm and stick them in the luggage hold. 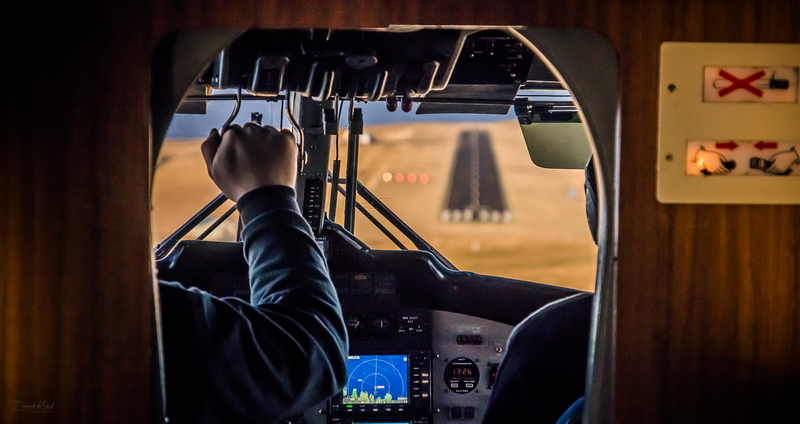 With a total of ten people in the waiting room, when someone came on the loudspeaker to announce the flight, Derek said, “I don’t know why he used the P.A., he could have just come in here and told us all”. But of the ten people waiting, half of them were going someplace else! Only one local kid and the three of us were getting on this plane to Grímsey, which made the checkin process make a bit more sense. We boarded the plane after holding everyone up a minute to take a picture, the same guy who’s loaded our luggage shutting us in and then flagging out the plane. It was a beautiful sunny day, and as we rose up and turned from takeoff, the snow and the grey cliff edges of the fjörds were beautiful as we headed towards the open ocean for Akureyri. Then the window one seat in front of us plopped out onto the seat. The outer pane was intact, but it was still funny, and H.W. deadpanned that hopefully that’s the only equipment malfunction on the trip. At the other end, the airport was even smaller- one room with a desk in it, and the lady who unloaded our bags and handed them to us talked a mile an hour asking us where we’re staying, pointing out the two guesthouses on the island, and commanding us to go to the Arctic Circle point, which was there in sight. We had to go there before we could get our certificates (signed by the pilot). We obediently went over there, lingering and posing. We were waiting for the plane to reload and depart again, as Derek wanted to try for the very difficult shot of us with the plane taking off in the background (he did it). Then we were snacking, when the lady from the airport, having changed out of her uniform and locked up the airport, came walking across the field to bring us our certificates. They were unexpectedly beautiful things, with our names done in calligraphy and yes, signed by the pilot. Because we had time, we went up the northeast corner of Iceland hardly any travellers check out, cutting off the corner from Mývatn to Egilsstaðir on the Ring road. There’s a great outdoor sundlaug north of Vopnafjörður, Langanes peninsula, and the northernmost tip of mainland Iceland, but still, it sees far fewer tourists. 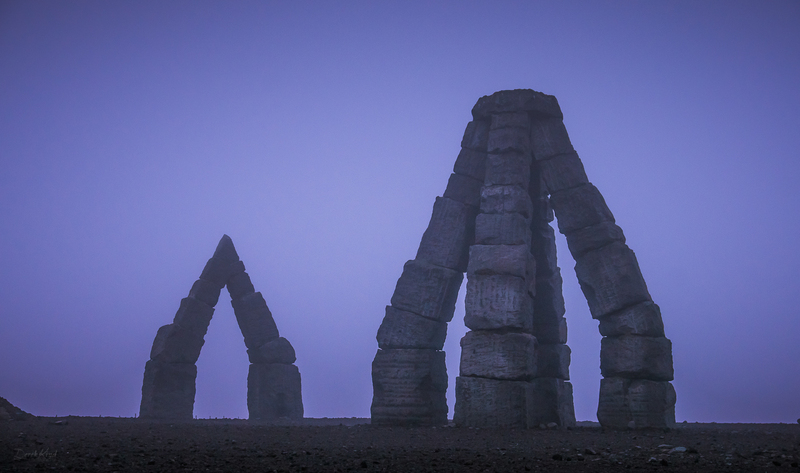 In Raufarhöfn, there’s a project to change that- the Heimskautsgerði, or Arctic Henge, is partially constructed. We arrived at dusk and found the giant columns of stone in the twilight much larger and impressive than I expected. 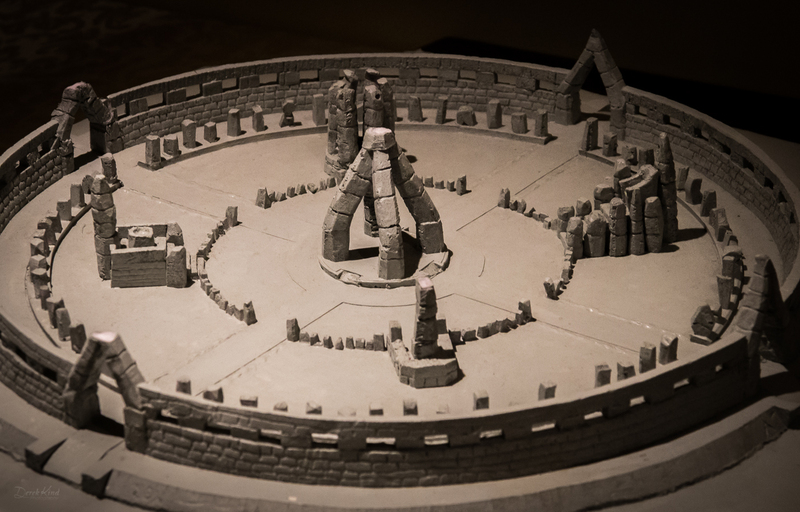 Just like Stonehenge, I was wondering how they built the center piece, with massive rocks leaning together and dependent on the last keystone at the top. Hungry, we then wandered into the recommended Hotel Norðurljos for dinner. The only customers there, our host Erlingur made us a truly exceptional meal (no menu, just a couple of verbal choices), talked with us at length, and then turned out to be one of the main incentives behind the Arctic Henge. He brought out a scale model of the full project, talked about how they had done what they had so far, the other minds and skills at work on the project, the meaning and philosophy of the design, and the full vision of the completed ideal. It is layered and deep and rooted in Icelandic mythology and poetry, and it will certainly be an un-missable attraction, one of Iceland’s great sights, when completed. We studied the plan and talked about it for some time, and he explained how they had built the four legged central spire. I could not have been more enchanted with the idea. I hope work continues and it sees completion. 2 Secret hot pool at Mývatn. No I’m not going to explain where it is. Apparently the instructions of how to get there are on the internet already, and other tourists find it. We had a friendly local tell us about this hot pool that the locals keep to themselves, as they must- Mývatn area is inundated with flocks of loaded tour buses in the summer. After saying that it’s closed to tourists, especially since one tourist broke a leg there, he then gave us exact (if arcane) instructions, saying you could find directions on the internet anyways, and if we could find it, we were entitled to be there, and besides if we encountered anyone, tell them he told us about it. We followed his insider instructions in full night darkness (instructions like “walk along the fence until you see a rock on the other side…the fence curves a little and there’s a bit of a shrub…walk along the edge and look down into it until you see a board”), and we found it. I memorized his words as he spoke, and I was going to find it. The best part was the “it’s all straightforward from there”, referring to the technical scramble down the wet and icy crevasse down to the water. I can sure believe someone broke a leg there, what I can’t believe is that he was extracted from the spot with a broken leg (“Icelanders do it blind drunk all the time, I don’t know how”). The water was an ideal temperature- clear and clean and deep. Crystal clear is a term often applied to water, but this water was so clear we could watch H.W. 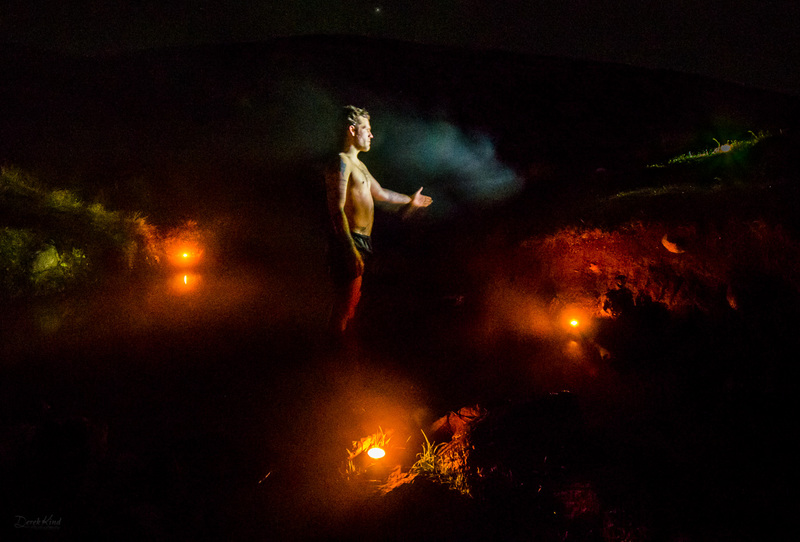 dive to his limit, about 50 feet, without finding the bottom, and I could still see his tattoos by headlamp, while stars from the Milky Way shone dimly overhead. 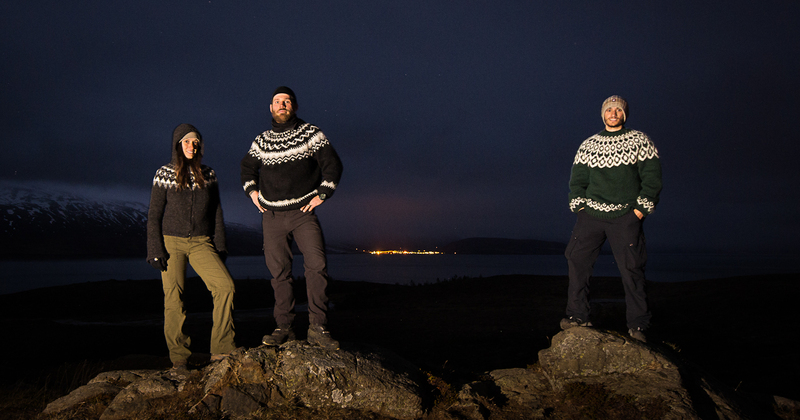 We even survived the climb out, and that night was possibly our best in Iceland. In gratitude we tidied the place up and packed out a bag of garbage. 3 Herring factory at Djúpavík. The road north of Hólmavík on the east side of the Westfjords from Drangsnes terminating at Krossnes (both places with notable hot pool action), snakes along a minimally populated fjörded coast and through Djúpavík, a ghost town relic of the herring industry. The three water tanks standing outside the factory have old heating coils in them, and are majestic, echoing concrete cylinders, astounding that they were formed with wood and poured by hand in the 1930’s. H.W. especially was fascinated by the huge factory building, and naturally, with that much dedication, he found a way to slide into the inside. I’m not going to describe that, either. The place is deadly dangerous and there are tours of the factory in the summer, but be assured our entry point didn’t involve any doors, damage, or force. There just happens to be a way in that really doesn’t look like a way in, so it has probably been overlooked. Or else they don’t care too much, if you’re that determined to get inside. 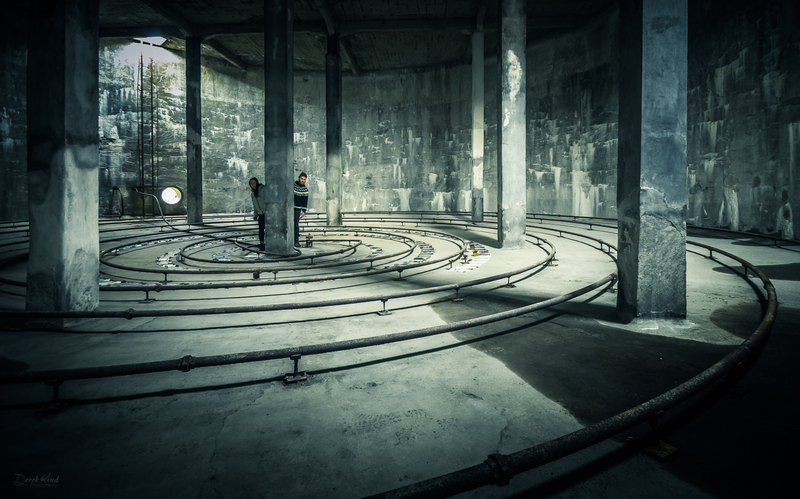 The inside is a catacomb of multiple layers, floors full of ancient, rusted equipment, storage, and parts of it have been turned into museum and art exhibit space. We tiptoed around for a long time, mesmerized by the abandoned infrastructure that became useless so suddenly when the herring schools failed to return. 4 Pool with kids at Höfn. 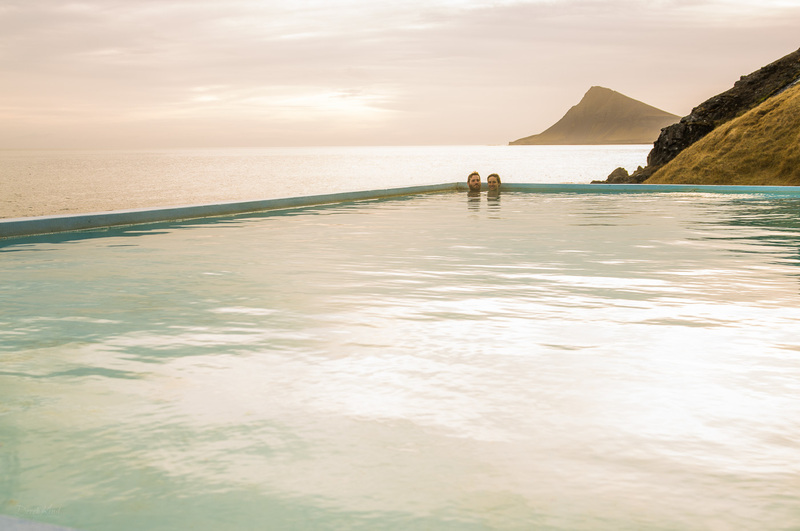 Swimming pools in Iceland are social spots, especially for children. There are piles of bicycles outside, and the kids seem to all come to the pool after school, leaving just as suddenly before suppertime. They play wildly, a dozen children with only a few adults around, splashing and running and leaping and shrieking with exuberance never seen or permitted in North American pools. It works, because there are distinct kid areas and adult areas, so the kids play wildly without rules or restriction in their area, and behave in the hot pools, where the adults soak and chat. Icelandic philosophy of ‘full freedom as long as it doesn’t impact others’ in full effect. Amazingly, no one ever gets hurt. We were minding our own business in the hot pool, but apparently the pair of foreigners aroused the kid’s curiousity. As if on a signal, every child suddenly got up out of the kids side and filed deliberately into the hot pot we were sitting in, completely filling it. There were about 18 kids, approx ages 8-13. They rambunctiously hollered between themselves until one boy, who’d clearly been prearranged, possibly dared, to do it, turned to us and said “good morning”. That brought a cascade of scorn down on him, which I could understand, of course. They teased him for having said good morning, when it was nearly dark, and he defended that’s what Anglos say! Then one astute little girl who’d noticed I’d responded to him in Icelandic, quietly and shyly asked if I spoke Icelandic. I told her some, yes, I’ve been learning, and that was it. 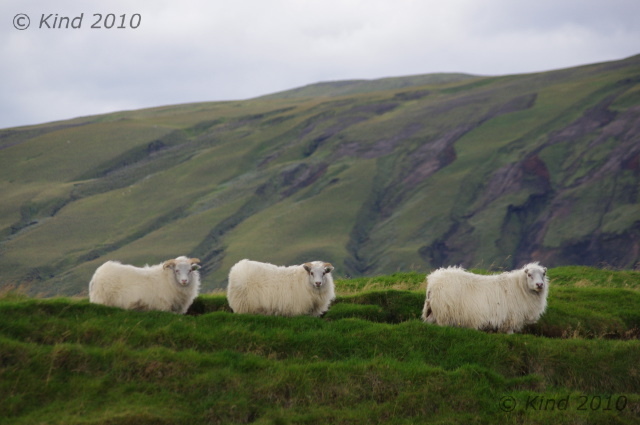 All the heads swivelled and stared raptly at us, and question after question was shot at us in Icelandic and English. “Can you understand what we’re talking about?” (in horror). Yes, some. Where are you from? All the usual questions, and then, asking me to say word after word in Icelandic, their names, names of towns and places, pointing at things for me to name them in Icelandic, asking about my husband’s tattoos that announced he was Amerískur while I was Canadian, questions about movies and TV shows, laughing uproariously at my pronunciation and correcting it patiently, answering my questions of how to say stuff in Íslensk. It was like a media scrum. One of the boys routinely held his arms out and pushed back on his friends, “back it up, back it up”, doing crowd control, because they were literally pushing on us, crowding in with their little faces and rapid fire questions, all shouting at once. “No, niður”. It was kind of scary to have that much questioning attention turned on us, my Icelandic was being severely tested, and it was adorable, too. For some reason I found their voices vastly easier to understand, and it was easy and fun to talk with them. I learned a lot, very quickly. They were so shy to speak to us and bold with each other. Eventually our novelty wore off, and they said goodbye and filed as one back out of the pool to resume chicken fighting in the big pool and dancing on the pool deck to Lady Gaga blasting from the loudspeaker. 5 Watching Looper and Skyfall in Ísafjorður. Ísafjorður has a wonderful old movie theatre. The kind with a double pair of big wood entrance doors, and between the inner and the outer doors, there’s a ticket window on the side. Pay your fare for lower or upper balcony (and get a seat assignment), then go through the inner doors and you’re looking at the screen and the back of the seats. There’s a little kiosk on the left back corner selling popcorn and candy, but not fresh stuff- pre-made, in bags, which by the way tastes like Smartfood and is amazing. The bathrooms are in the same big theatre room, and stairs go up to the balcony. I love the institution of intermission. No matter what is happening on screen (Intermission in Skyfall caught Javier Bardem with his mouth open mid-sentence in a very intense part), someone pushes pause, the screen freezes, and everyone rouses to reality momentarily to go pee, buy more popcorn, and stand, stretch, mill about, and chat. It’s a great opportunity to talk about what’s happened so far and share your speculations about what happens next. Intermission rocks, and this beautiful theatre is wonderful. It doesn’t even play shows every night. Possibly, the schedule may have influenced our decision to spend another night. Our first visit to Iceland in 2010 demanded another, and we went to Iceland again in 2012, this time with my husband and two bicycles. This is the site I created to tell the story. Click on my picture for my home blog. We traveled Iceland for 27 days in 2010, and that is described day by day, in great detail (scroll down to "Iceland 2010", and "Day 1"). The dates have been adjusted so that the tale of the 2010 trip reads chronologically. Numerous extra photos that didn't fit neatly into each post can be found through the tabs at the top of the page. 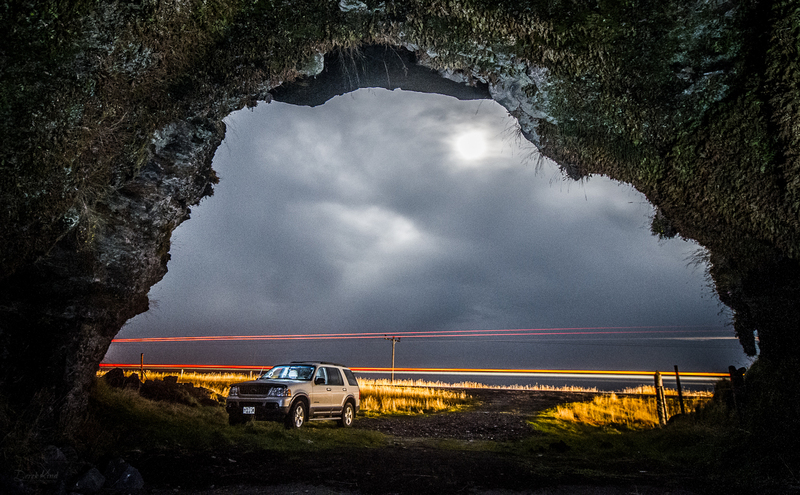 Glossy, quality, 12-month wall calendars of Derek Kind's incredible photographs of Iceland are available at Zazzle.com!